The Best Books Ever: Crown of Embers Review and Giveaway! Crown of Embers Review and Giveaway! This was such a fantastic book. I admit, I enjoyed the first book, but with some reservations. I have to say- the reservations that I had about the first book were completely gone in Crown of Embers. Rae Carson writes with confidence and the ease of someone who has 30 books under their belt. This second book takes up a few months after the first ends. Elisa is the queen of her country. But although she was a hero in her own country, there are many who want to see her gone- even in her own castle. She has very few people she can trust. I absolutely love that a majority of this story is about Hector and Elisa. It was so fantastic to see such a slow developing love story. Rae Carson wrote the kind of love story that makes you want to read faster in anticipation of what is coming. She takes her time with the characters, not rushing into something, but developing a slow simmering passion between the two main characters. I loved it! I wondered at the end of the first book if Hector would become a love interest for Elisa and I am so glad that is the route the author went. I found myself waiting excitedly for every time these two characters had scenes together- they oozed passion and longing... and restraint. So much happens in this book. The first half of the book takes place in the palace and in Elisa's kingdom, and the second half is much more of the traveling adventure in the first book. I don't want to give away any details but I will say- this book was action packed! The last chapter will absolutely make readers shake their book and howl in anguish (I personally threw my copy ha ha!) This is absolutely a trilogy and there is a massive cliffhanger at the end of the book- full of drama and everything that Rae Carson is so good at writing! If you haven't read this series yet- get on it! This is one of the best fantasy series that I have read- it absolutely is up there with Poison Study, Shadow and Bone, and all my other favorite fantasy series. 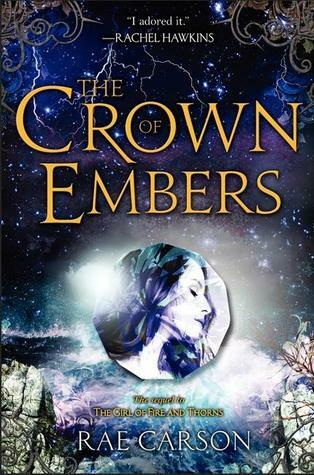 Want to win an Advanced Reader's Copy of Crown of Embers? (Yes, it is mine- no it wasn't too badly damaged when I threw it across the room in rage lol!) US/CA only please 13+ All my normal rules apply! This book sounds really good. I'm glad that you enjoyed it! I love books with adventure, a great love, and full of passion. It's magical to be so captivated by a story as I can tell you were by this one. What a compliment to Rae Carson as a writer. I too get frustrated with cliffhangers at the end of a book, and having to wait a year or longer for the sequel doesn't help. However, with the cliffhanger, you have the next book to look forward to and it's exciting when a great story continues! I haven't read a fantasy book in a while and this series sounds fantastic. Great review!